A couple of years ago I visited a remarkable Indian restaurant in Hammersmith. 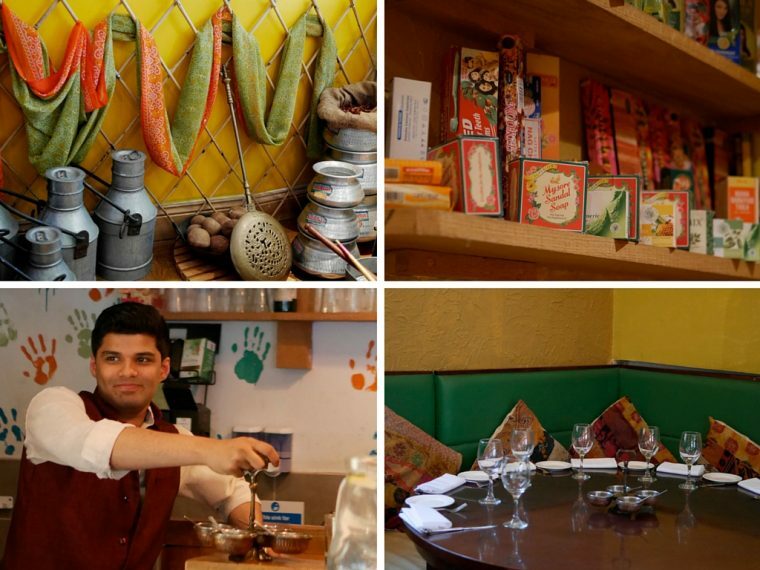 Potli isn’t posh, it’s the kind of place you’d like to find round the corner from where you live, somewhere to pop in on a regular basis. It is, however, very different. 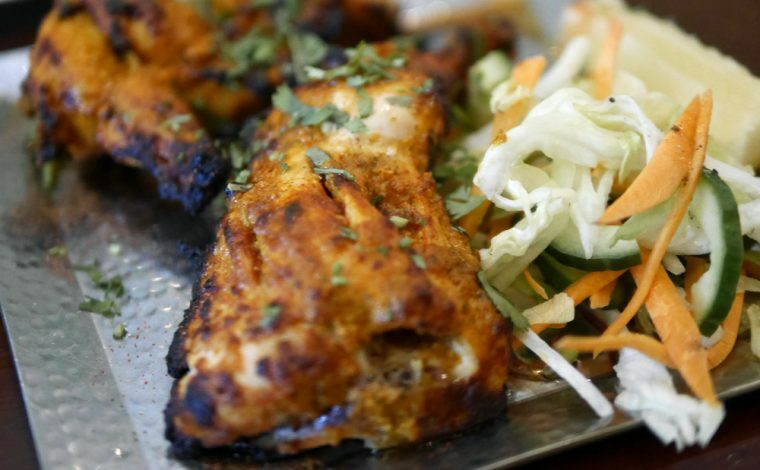 What makes it remarkable is the selection of regional Indian market food – the sort of dishes you’d find in India if you went off the beaten track a bit (or like me, when I visited Chennai, had a local guide who will take you away from the tourist places). Potli serves the market food of India. Not necessarily the dishes that your mother would have cooked but the ones you might find in an Indian bazaar. It is fun, relaxed and quirky, though to navigate the menu properly you need to understand the geography of India rather better than I do. Right now, they are in the middle of an event called ‘Chaat Festival’ with a special Chaat menu. I went along to try it, accompanied by a young friend with a penchant for Indian cuisine. 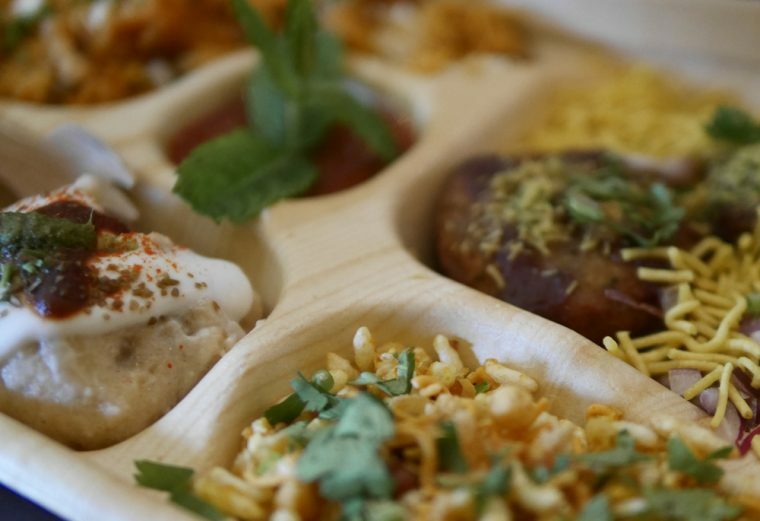 It would have been a shame not to try the Chaats, especially as Potli offer a mixed platter for £9.50. You get to try Jhal muri – a kind of spicy puffed rice with peanuts, sev and lemon, delicious ragda pattice (spicy potato patties topped with gram flour crisps), an unusual dish called dahi bhalla – a special lentil dumpling dopped in a sweet sour yoghurt and topped with tamarind and jiggery chutney and my favourite of the dishes, a chana and pakora chaat which is, apparently the Chef’s mums secret recipe made with lentils, black peas, puffed rice, peanuts and chutneys. My companion ordered a very generous starter portion of Tandoori Chicken (£8.00) which is half of baby chicken marinated in a homemade special tandoori spice mix and cooked in the tandoor. The best she’d ever had, she declared. Though she managed to try all the Chaat dishes too. She went on to eat another chicken dish which I believe was chicken jhalfrezi (£9.75 ), but if I’m honest I can’t remember exactly what she ordered. 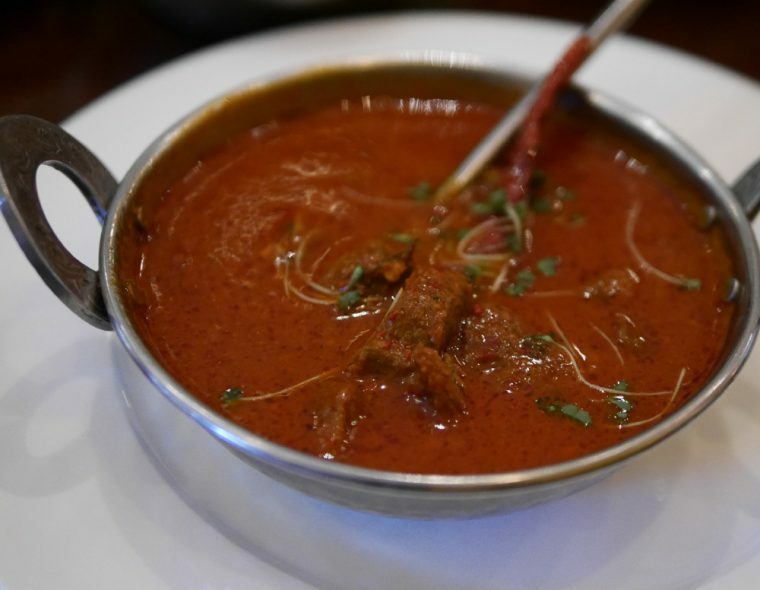 The Venison I chose, Hiron Laal Maas (£15.00) is a house speciality – a delicious casserole of haunch of prime venison diced and simmered in a traditional Rajasthani sauce (from the North West of India, where rich game dishes are common). We ordered rice and a side order of a punjabi chana masala (£5.50) and of dal makhani (£5.50) to accompany our mains, though in all honesty we didn’t need more food by this stage. 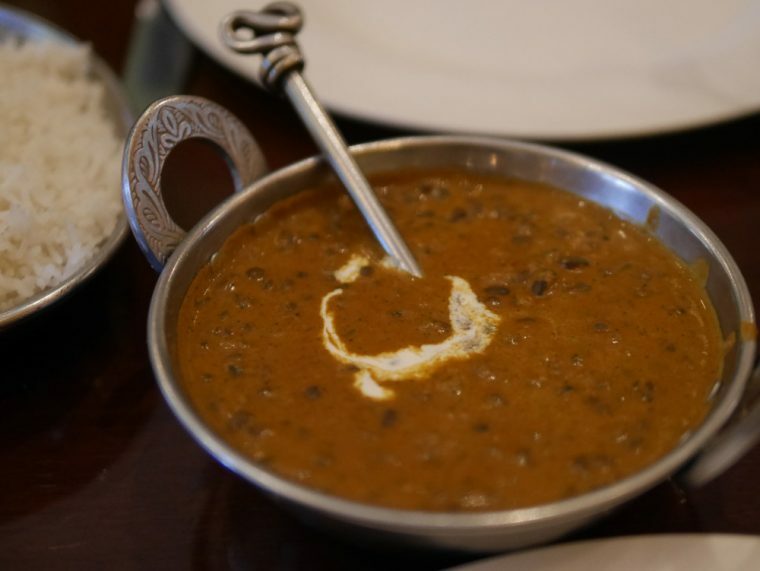 I love dal, it’s one of the most comforting dishes I know of, and dal makhani is a very special black lentil dish which takes 24 hours to prepare. This one was rich and creamy and the perfect side dish – if only I hadn’t eaten quite so much chaat. We did manage to finish most of our main course dishes, but neither of us could cope with dessert. Instead, a cup of masala chai to round off a splendid evening. With many thanks o Uttam Tripathy and the team at Potli for such a splendid meal. Off to the Estate Agent right now to find out about moving back to West London! What a fabulous meal and array of foods. It looks lush, luxe and so enticing. How could you not eat some of everything! 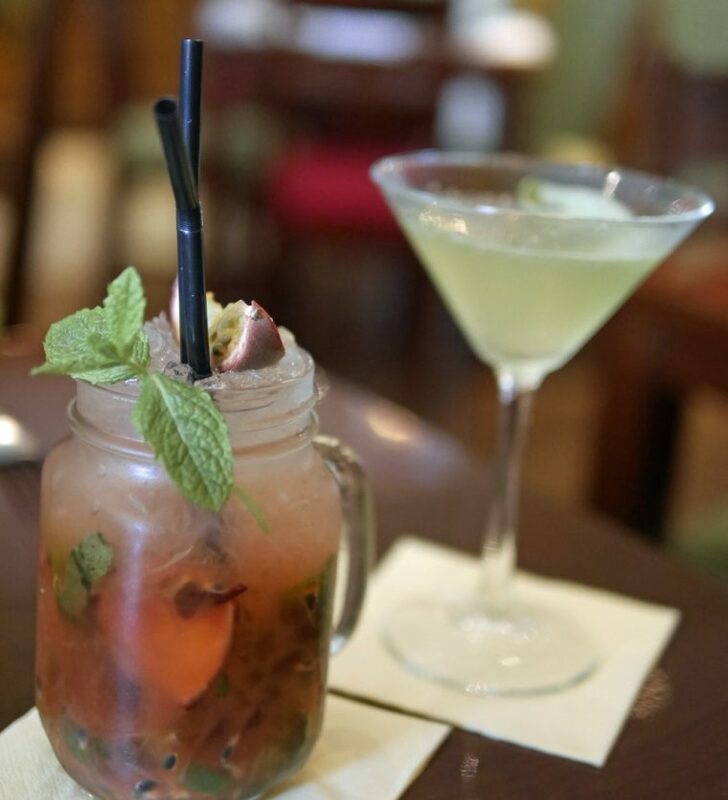 I especially like the cocktails.